The Center for Missional Excellence and Lakewood UMC will be hosting GBGM Missionary Willie Berman on Tuesday, April 23, 2019. Willie will be sharing on-going missional opportunities in the Tamaulipas region of Northern Mexico, as well as ideas for new partnerships with the Texas Annual Conference. 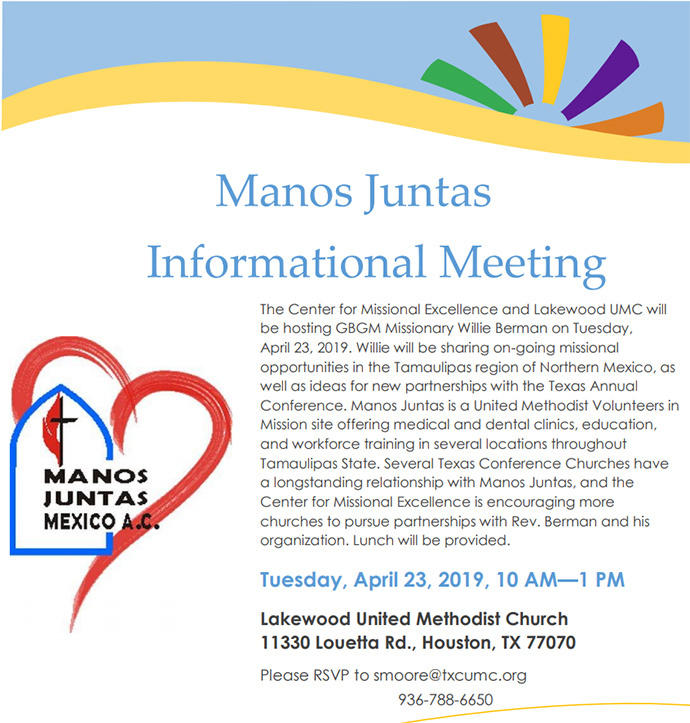 Manos Juntas is a United Methodist Volunteers in Mission site offering medical and dental clinics, education, and workforce training in several locations throughout Tamaulipas State. Several Texas Conference Churches have a longstanding relationship with Manos Juntas, and the Center for Missional Excellence is encouraging more churches to pursue partnerships with Rev. Berman and his organization.